LAS VEGAS – Floyd Mayweather puts more meaning to his ring name “Money” every time he fights. 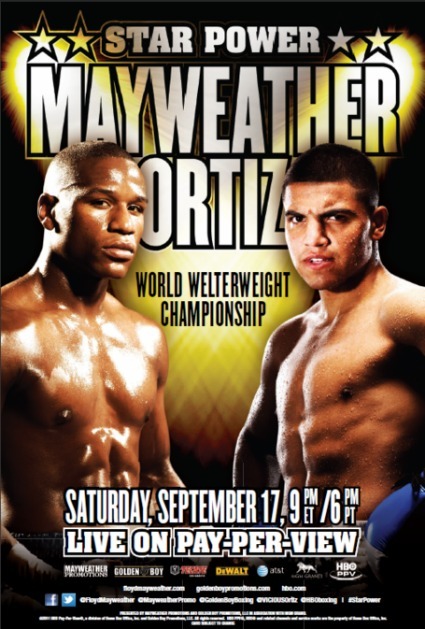 With early pay-per-view numbers counted and confirmed, the pugilist’s recent STARPOWER fight against Victor Ortiz generated buysfrom 1.25 million homes with a value of $78,440,000 dollars in pay-per-view revenue. These numbers make the event the second highest grossing non-heavyweight pay-per-view event of all time. With another successful pay-per-view event under his belt, Mayweather continues his reign as the biggest and most lucrative attraction in the sport. He has now appeared in the three biggest non-heavyweight pay-per-view events in the sport’s history, including Mayweather vs. Oscar de la Hoya ($136,853,700), Mayweather vs. Ortiz ($78,440,000 million) and Mayweather vs. Sugar Shane Mosley ($78,330,000 million).